I have a Post-Graduate Certificate in Education. I also have a special certificate to teach English as a foreign language. 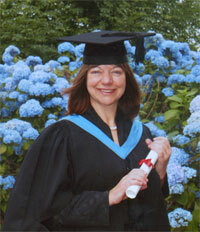 I gained my teaching qualifications in 1998. I also have a Masters Degree in Contemporary European Culture: Language, Literature and Society. The photo on the left shows me receiving this award in 2008. I have been a full-time, professional language trainer for fourteen years. I established my language school in 2001. 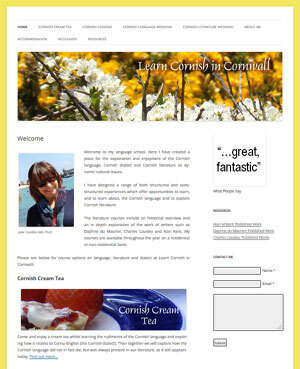 I teach four languages: English, French, Italian (for beginners) and Cornish. My clients for Business English include Siemens, Imerys, Continental and Media-Saturn. The most important thing about my language school is the quality of my teaching and the care I take with each student. I use the Common European Frame of Reference for Languages to assess the level of my students when they arrive. We work together to establish the goals of each individual student in relation to each of the language skills eg. speaking, writing. Then we make a learning / teaching contract about the best way of achieving those goals. We review this process each week. At the end of our time together, we celebrate our success. I love learning languages myself. I am a fluent French speaker. I am currently learning the Cornish language. I have also learnt some Latin, Italian, Spanish, German and Afrikaans. I know and can understand the challenges involved in language learning.